You don’t believe in gods? 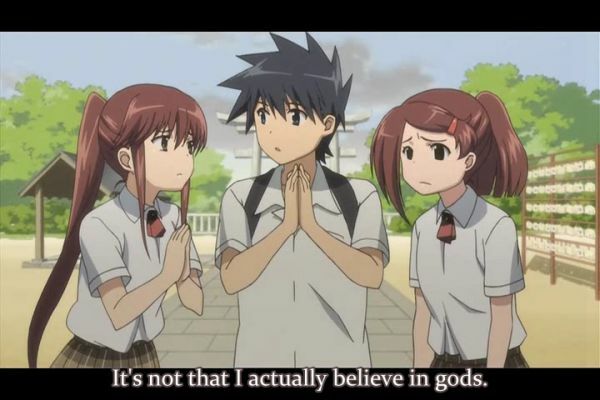 Fine, there are a lot of gods I don’t believe in either. Â Just don’t be a donkey about it. The Economist has an article about the Pew poll (what an ironic name in this context) about religious knowledge. Shockingly, this poll showed that members of the Christian majority knew a lot less about the minorities than the minorities knew about them and each other. Who would have thought it? Next we will learn that black kids know the name of more white Presidents than white kids know of black Presidents! Now, the really funny part is not this piece of non-news, but the excited crowing by the official atheists about their 0.4 point lead over the Jews and 0.6 point lead over the Mormons. Evidently this finally vindicates their claim of mental superiority. I see a different pattern though. Rather, the sudden loud braying of the atheists (not only when asked to comment on this article, but also on Facebook and other social media) compared with the silence of the Jews and Mormons (who probably feel ashamed that they were not able to answer all the questions). I think this reveals something profound about what makes people atheists in the first place. But first a little detour to Norway. Here, some 75% of adults are atheists. (More among the young, and the proportion is rising as the last generation of “Christians by default” are dying from natural causes.) Do you think they would do much better than the American Christians? Hopefully a little, given that our educational system is better. But nothing like the American atheists, because in America, atheists are people who actually bother. In Norway, it is the default. Â Conversely, the questions are trivially easy for me, a Christian in an atheist country. But the arrogance of the outspoken atheists is much the same here in Norway as in the USA. It is their calling card, so to speak. As well it should be, because the only reason for atheism is a gargantuan arrogance. It is roughly comparable to a deaf person being convinced and preaching that music does not exist. Sound, sure. You can feel the house vibrating when you turn up the stereo. But music? Ridiculous superstition. It is easy to prove, because people who claim to be musical – or even to be musicians – cannot disagree on which music is best. Furthermore, they are unable to describe it in any logical way that makes sense to an outsider. Â In other words, it is all in their head. Anyway, the outrageous part is the absolute faith in that which cannot be seen, namely the non-existence of God, gods, angels, high spirits or whatever. To just ignore the entire theosphere and tell religious people to mind their own business is one thing. The absolute conviction is what takes an unimaginable amount of arrogance. This is why arrogance is the prime virtue of atheism, kind of like compassion is for Buddhism. But am I not equally arrogant in writing off Zeus, Poseidon and Athena? No, not at all. The fact that Bach is far superior to the Rolling Stones and that rap is the anti-music is based on direct observation and repeatable experience. This is entirely different from the reductio ex nihil of the spiritually deaf and mute. “There is no god and I am its prophet!” Â Why the hell do they even bother? Secular frustration? Oh wait, they want to liberate us. Good luck with that. As long as you do it by giving Bibles to the children, I’m not going to stop you. (As opposed to the Lenin, Stalin and Mao method of atheist liberation.) I actually agree that people who have read the Bible and are not horrified either by the Bible or themselves have probably not truly read it in the first place. Which of the two outcomes, though, I believe that depends on your level of arrogance. This entry was posted in religion by itlandm. Bookmark the permalink. This is a very good entry. I have a terrible headache or I’d try to write more. I can’t write comments on the level your post was written, anyway, so I suppose it is just as well! Ack. The most vocal atheists and crazy fundamentalists like Dawkins and the nutcases in the Westboro Baptist Church get all the attention. Everyone usually ignores the simple non-denominational Chrisitian and apathetic non believer. Atheism is just a lack of beliefs in deities. Nothing more. Do not lump Lenin and Marx in with Stalin and Mao. Weak atheism – to simply live as if there were no gods – is just agnosticism in practice. Even most religious people do this much of the time. The madness is the absolute conviction of non-existence, and the missionary activity on behalf of nothing. And I’m not lumping Marx. He was just a misguided philosopher. Lenin was a misguided philosopher who also threw one of the world’s largest empire into a bloody civil war.